In our first post we talked about how INASP’s thinking around capacity building has been influenced by recent debates on complexity and systems thinking and by our 2012 evaluation. We also outlined what we mean when we talk about research systems. In this post we want to discuss how we go about understanding the national research systems we operate in, and how we make the most of our relatively modest role within these systems. 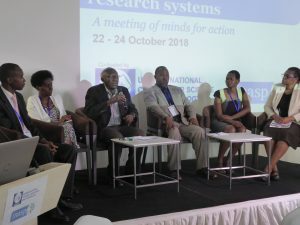 When we set out to understand national level research systems we noticed a lack of documented research or case-studies in developing countries. So, as a first step, we commissioned profiles from partners in each country. The focus of the profiles was on documenting the formal components of the system; government agencies, major research institutions, science councils and academies, and national research agendas. These weren’t intended as sophisticated pieces of analysis, but rather as an initial map to work with so that we could begin to identify (i) the links we would need to make and (ii) the opportunities to make connections within our own work and to what others are doing. Importantly these profiles were written by people who work within and understand the national research system in each case, not by outside consultants. Where the country profiles lack a good analysis of how decisions are made we’ve now begun to build on these with more in-depth ‘dynamics’ studies. These will combine further analysis with what we learn from visits to partner countries, which give us an opportunity to meet existing partners, but also to expand our networks to meet other key individuals and organisations who we’ve not previously encountered – within the university system, other research organisations – including NGOs – and government agencies. Making country visits outside of a specific programme activity (e.g. delivering a workshop) is relatively new for us, but we felt it was important to devote time to simply improving our understanding of how things work in each country. As well as discussing issues with partners, we’ve also been able to meet representatives of other research and funding agencies – national and international – and to identify opportunities to work with them. This combination of profiles, further analysis, and country visits is taking us some way towards what Duncan Green describes in his account of village power analysis. We’ve got the official structures mapped, understand the formal structures better, and we’re beginning to get a feel for how the informal connections between people and organisations can enable – or hinder – the work that we and our partners do. We realise that we’re a relatively small player in any of the research systems that we set out to support so we’re consciously looking for opportunities to link what we do to what other organisations are doing. We also want to make sure it’s consistent with national level strategies. In Ghana we’re working with the civil service training centre to strengthen capacity for research use in the civil service, and we’re supporting access to research literature, working with the Consortium of Academic and Research Libraries to train librarians to manage online resources and provide information skills training. In Tanzania we’re working with the Consortium of Tanzanian University Libraries in a similar way, as with the Tanzania Education and Research Network to improve IT networks on university campuses, and with the Commission for Science and Technology and VSO to support the national academic publishing system. 200 Ghanaian and 150 Tanzanian researchers use the AuthorAID platform to access advice and support in getting their research published. In addition 24 Ghanaian journals and 17 Tanzania research journals are accessible via our sister initiative, African Journals Online. Together these series of activities combine to support multiple aspects of the national research system. To effectively leverage our place in a system we need to be able to identify where there are critical connections to be made. We have a good sense of our immediate working environment – the institutions and the people that we work with most closely – but we’re now trying to identify where we need to go beyond these familiar relationships. We’ve worked for many years with librarians on the ‘access to research’ side of things, and with researchers and journal editors on the ‘production of research’ side and with policy makers on the ‘use of research’ side. But there’s a risk that despite our best intentions to support national systems, we end up working in silos and don’t make connections between the groups we already work with where necessary. There’s also a danger that we miss some critical connections with other key people, who exist slightly outside of our core partner groups, but who might possess the vital combinations of ambition, resources, and institutional power to drive things forward. For example, our work has brought us into contact with university administrators at various levels – people who are key to achieving real change within institutions – but we haven’t done much to consciously bring them into our programme. And we know that the media plays an important role in influencing policy making and critiquing the use (or not) of evidence by government, but we haven’t fully developed this side of our evidence-informed policy making work. While we, and our partners, have relationships in these areas, we haven’t explicitly addressed the people who might have the power to really make things happen. What these connections and links to various people in different parts of the systems often give us is the ability to act as a broker or convenor for the right people to tackle a particular problem. 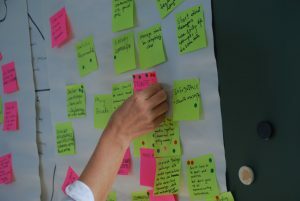 Around a given problem – for example, better access to research literature – it’s remarkable how often each individual involved wants change; researchers want better access, librarians want the literature they’re providing to be used better, university managers want more research to be done or teaching materials to be improved. There may also be broad agreement about what kind of change is needed. What is often missing is either the legitimacy to start a conversation about it – it’s not a problem that sits neatly in one person’s or department’s responsibility – or the drive to put it at the top of the agenda so that something actually happens. It’s not unusual for us to be told ‘those people wouldn’t have come to the meeting if we had called it ourselves’. This kind of convening also has the potential to begin to build the coalitions which are needed, but which are often blocked by existing silos of hierarchy, responsibility and thinking. This convening and brokering role can be across borders, for example a conference in Nigeria brought over 50 delegates, representing 18 countries and four continents, to consider how countries can actively support evidence informed policy making (EIPM). The conference helped articulate some of the challenges of supporting EIPM in developing countries but also provided some useful tips for engaging with policy makers. We also have a role brokering in country – within the different parts of the research sector, or even fostering links within a single institution to tackle shared challenges. Sometimes it’s the visit of an external organisation that helps to make this happen. On a recent visit to Mozambique we were able to bring researchers, librarians, and IT staff together into the same room, alongside the vice rector under which all their work sat. In a few hours the conversations that developed started to make the vital links across different bits of the university community, connecting up the people providing access to research literature (the librarians and IT staff) with those who used it (researchers), with the person who had the power to make things happen (the vice rector). While we’re striving to take more of a systems approach to our work, by bringing together different people and organisations, within and across organisations, we recognise that these are just parts of a much bigger national research system. It’ll be some time before we can talk confidently about working at this level – we’re still learning a lot as we go. Saa ngapi (What time is it)? Dear Jon and Alex, I truly welcome that you are sharing your questions and experiences about how to better incorporate systems thinking and complexity in your capacity building work. A lot of the things you are finding out and trying are very consistent with findings shared in an incredible book by Westley, Zimmerman and Patton called “Getting to maybe”. I am still wondering why this book has not made it into many of the debates and exchanges I participate in since it offers extremely relevant concepts and experiences that can illuminate how we move forward. For instance, what you are currently doing (a mix of your understanding the system and convening and brokering) is very similar to what a tribe in Ethiopia, called the Afaris, name dagu. They believe “it is a sacred responsibility to listen and share dagu-a word that means information, though it impies more than pure data. The Afaris are nomadic cattle herders, and they have existed for thousand years in a harsh environment where most nomadic tribes have been wiped out. They claim that dagu is the secret to their longevity: ´Dagu is life´ is an Afari expression. Being nomads, Afari families travel from place to place, seeking better conditions for their cattles and themselves. Every so often they will meet another Afari family, and no matter what they are doing and where they are heading, they sit down to talk and listen, usually for hours. The exchange of dagu trumps all other responsibilities. They share what they have seen and heard about the environment, about health issues (both cattle and human), about political tensions, about new relationships. As they talk, they provide the facts as they have seen them or heard them, but also their interpretation of what these facts mean. They collectively make sense of the patterns that are emerging. I believe this is a very potent concept if we desire to better deal with complexity in capacity building. Are we really counting with others to detect the relevant patterns? Are we using the sensitivity of local sensors to bring on change? One of the other points the book made was the importance of being close to where change may happen: generally those who are most adept at making change recognize the local rules of interaction and then leverage them to increase their potential. In this sense face to face interaction (and country visits like the one you mention that are not specifically related to a specific programme activity), can convey a rich array of information that helps people make sense of the patterns, learn quickly and adapt to changing contexts. This is just one reflection among many inspiring thoughts that emerge while reading the book. I am currently thinking into transforming this book into a series of posts where –hopefully with others who might be willing to join- we draw from these concepts and provide ways in which they could answer questions we have, or illuminate new practices or influence how we make decisions. At least, I really recommend reading it bearing in mind the challenges you are trying to deal with! 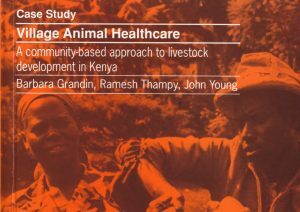 The AuthorAID team at INASP have for many years run train-the-trainers workshops on research writing (as part of the ‘production of research’ side you’ve mentioned), and we have evidence of these leading to cascaded workshops locally. But it often takes more than a few motivated people to create change at an institutional level, even if there are some promising and immediate outcomes. So we’re moving towards a systems approach, recognizing that front-line professionals, no matter how motivated, make up only one part of a capacity building programme. For the next AuthorAID train-the-trainers programme, which will be held in Tanzania later this year, we’re planning to not only interview the training candidates in the selection process but also speak with administrators beforehand, the people who have a concrete interest or remit in improving the production of research in their universities. A small step towards a systems approach!